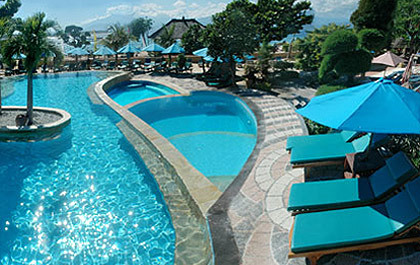 Vila Ombak Hotel Gili Trawangan is the first international hotel on the magical island of Gili Trawangan, it is a place that balances the comforts of first class accommodation with the natural beauty that surrounds. The Villa Ombak Hotel features the traditional building style of Lombok, and its neighboring islands, to blend harmoniously with the island's landscape. Hotel Vila Ombak winning award of the Luxury Hotel category on The World Luxury Hotel Awards 2010 voted by independent jury, journalist, travel agents/tour operator and guest whom stay in the hotel trough World Luxury Hotel Award website. Voting cast by a selected panel of 50 leading tour operators & travel industry consultants. Luxury is changing. It’s not just about good food or service. It’s increasingly about discretion and simplicity. It’s a bold approach to exclusive hospitality! A combination of different factors such as facilities & service excellence, exceptional food, attention to detail, effective management, and many more, are part of the parcel that constitutes a ‘legendary hotel’. The World Luxury Hotel Awards aim to maintain overall service excellence & build guest loyalty. Superior Lumbung Hut. There are two different Lumbung Huts available, both uniquely combine first class facilities with traditional Lombok Sasak architecture. Lunbung Huts also feature a semi-open bathroom with a tropical garden for the ultimate island shower experience, an open-air living area furnished with a Bale, table and chairs and, hammock to optimize the lounging experience. 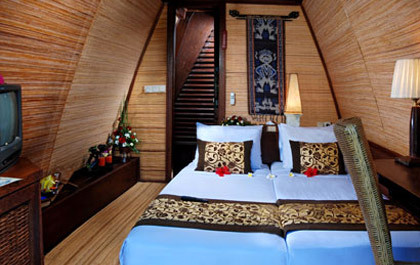 Deluxe Lumbung Huts are a classic representation of island life. Set in tropical landscaped gardens, each freestanding hut has a furnished balcony, outdoor tropical bathroom with garden and furnished private open-air living area. The Deluxe Family Bungalows are spacious and congenially furnished for family-friendly accommodation, located close to the hotel's main facilities for the convenience of your family. These rooms are half houses with spacious sleeping and living areas with enough space to sleep up to 3 adults or two adults and two children. 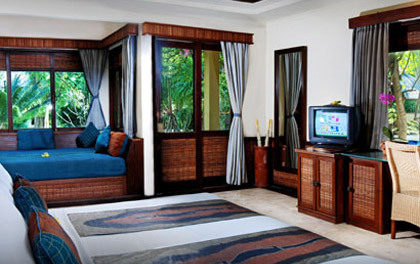 Deluxe Ombak Room is equipped with a double bed or twin bed arrangement, an indoor day bed that is easily converted into an extra bed to sleep two children or one extra adult and comes with an interconnecting option, available for larger groups or families with older children. 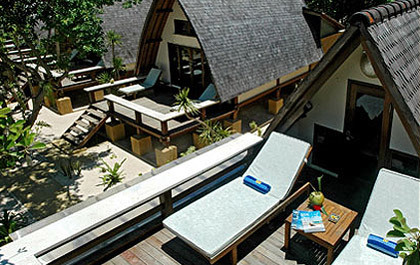 Lumbung Beach Cottage Offering intimate boutique accommodation designed for romancing couples, the Lumbung Beachside Cottage boasts amazing beach and ocean views, offering Hotel Vila Ombak’s private beach at it’s doorstep. Lumbung Seaside This blend of modern and island feeling embraces its natural surroundings to give you a view onto the sea over gardens and against the backdrop of Lombok’s mighty Mount Rinjani. Akoya Pool Villas For those longing to experience the tranquil seclusion of a tropical island the Akoya Pool Villas are ideal. The Akoya Pool Villas have a private pool, a spacious open living area with a kitchen/kitchenette and a bale (an elevated lounging area) which can serve as an extra sleeping opportunity. Facing the sea and Lombok's towering Mount Rinjani, The Ombak Restaurant is a comfortable two-storey space, decorated with the area's arts and crafts. Nestle into one of its many cozy corners or sit outside at the beach terrace next to the waves and enjoy the many delicious food choices. From summer 2005 there will be an additional specialty restaurant directly on the beach. Next to our more than 200 meter long beach enjoy our 3-level swimming-pool (saline water) with jacuzzi, waterfall and pool island. From there you can look onto the sea and the neighboring islands with the impressive Mt. Rinjani in the back.